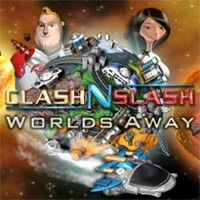 In Worlds Away, like the original Clash 'N Slash, you must defend your planet from waves of alien attacks that will arrive from all around the galaxy. This time the alien hordes are more diverse and clever! As you explore more than 70 thrilling levels, you'll face a ton of enemies and 12 tough bosses. Use the 19 fantastic weapons that you have at your disposal, along with 17 amazing power-ups, and you'll be cruising to victory, one wave at a time! query: INSERT INTO accesslog (title, path, url, hostname, uid, timestamp) values('Clash N Slash: Worlds Away', 'node/1344', '', '3.80.224.52', 0, 1556143183) in /home/surelion/public_html/drupal-4.6/includes/database.mysql.inc on line 66.